C.J. 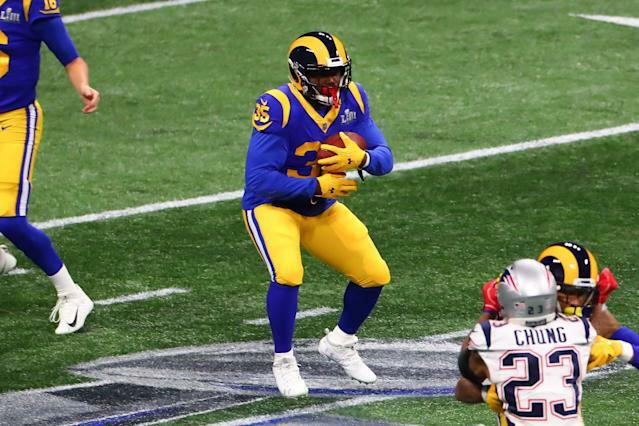 Anderson played a significant part in the Los Angeles Rams’ postseason run last year — filling a much-needed hole after Todd Gurley went down with a knee injury and helping them secure the first-round playoff bye. The 28-year-old running back put up two 100-yard games to close out the season for Los Angeles, and ran for 123 yards and two touchdowns in the NFC divisional game against the Dallas Cowboys. Undoubtedly, he was a perfect replacement. Now, though, Anderson is a free agent — and he’s not happy about it. Lol the disrespect is real guess It is what It is. It’s the same story over and over. All I ever wanted was a full opportunity to play 16. My 16 vs anybody else 16 with no front office / coach trying to move me out the way or play we like this guy game. Just want a 16 all I ask. While he had a strong finish to the season, Anderson has played in just one full 16-game season in his six years in the league. In 2017, his fifth year with the Denver Broncos, Anderson put up 1,007 yards and had three touchdowns. Last year, he played in just 11 regular season games and put up only 403 yards with both the Rams and the Carolina Panthers. Even though the Rams aren’t likely to bring him back in, Anderson said his tweet wasn’t about them specifically not giving him an opportunity. By the way my disrespect tweets last night had nothing to do with the rams. Had a long convo with some 1 I trust and that’s how that convo ended. I thank the rams for a beautiful opportunity It was very fun. After being released by the Broncos, Panthers and Raiders, and the Rams not wanting to bring him back, it’s easy to understand why Anderson would be frustrated. Bouncing around from team to team is never easy. In reality, though, it’s still early. It’s not unreasonable to think that an organization will be willing to take a chance on him this fall — especially given the fact that he put up a 1,000-yard season just two years ago. At least, Anderson clearly sees it that way.